The Chatham Anglers (20-18-3) have only three games left in the regular season before starting the playoffs on August 4. Despite having two off-days this week, there is still plenty of action to discuss. How is the playoff race in the East shaping up? 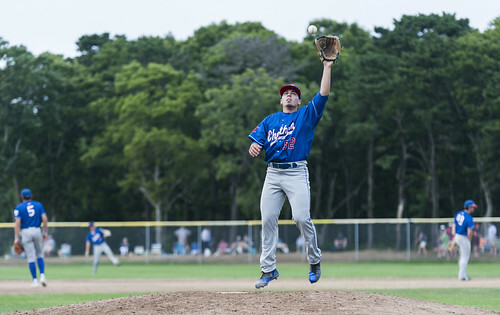 David Schneidman: Since clinching their spot in the playoffs on July 25, the Anglers have followed the results of two teams — the Yarmouth-Dennis Red Sox and Harwich Mariners — to narrow their focus on who they will play in the first round and where it will be played. In the past two days, all of Chatham’s questions have been answered. With an 8-6 win over the Mariners on Saturday, the Red Sox clinched the top-seed in the East Division. The A’s squandered their best chance to inch closer to Y-D for the one-seed Friday. Chatham led the Red Sox, 4-0, heading into the bottom of the seventh inning at Red Wilson Field but conceded four runs before the game was called due to darkness after the eighth inning concluded. The closer of the two races was between the Anglers and Mariners. Chatham sat two games ahead of Harwich entering a meeting between the sides on July 25. The A’s emerged victorious, 6-3, further separating themselves from the three-seed. Sunday, the Red Sox trounced the Mariners, 8-1, to lock in Chatham as the two-seed with home-field advantage. The finalization of the seeding signifies the Anglers will face the Mariners in game one of the Eastern Division semifinals on August 4 at Veterans Field. Peter Warren: Orleans and Brewster have been engaged in a battle for the fourth and final playoff spot for over a week now. The Whitecaps pulled out a 4-3 victory over the Firebirds on Sunday to jump Orleans in the standings. Heading into Monday’s action, Brewster is 12-24-4 with 28 points while Orleans is 13-26-1 with 27 points. Both teams have four games left in the season. Brewster travels west on Monday and Tuesday to play Cotuit and Falmouth before playing a home-and-home series with Harwich with the final game at Whitehouse Field. Orleans travels to Hyannis on Monday, plays Y-D at home Tuesday and ends the season with a home-and-home against Chatham. Brewster appeared to be on the outside looking in two weeks ago. Orleans no-hit the Whitecaps, 3-2, on July 15 to push the gap between to. Since then, Brewster has played consistent baseball while Orleans has struggled mightily. The Whitecaps are 5-3-1 during that span while the Firebirds are 1-9. Orleans’ one victory came over Harwich on July 24. 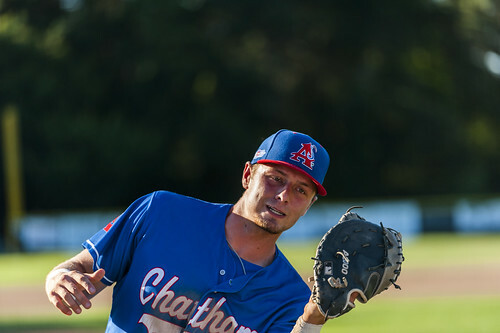 With this playoff race likely to last until the last two games of the season, Chatham will still be playing games with playoff implications for the rest of the season. The Anglers added a bevy of new players in the past week. Who are they and what impact will they have? DS: With the departure of relievers Troy Miller (Michigan) and Greg Veliz (Miami), A’s manager Tom Holliday aimed to bring as many new arms to Chatham as possible. Joseph Lowder (Appalachian State) and Reeves Martin (New Orleans) each got the call early last week and have since appeared on the mound for the Anglers. Lowder posted a solid debut inning Saturday at Hyannis, striking out one while forcing a groundout and flyout. The right-hander got another chance to show his stuff on Sunday at Veterans Field but could not churn out a similar outing. Lowder entered the game in the ninth, hit and walked a batter, tossed a wild pitch and allowed an RBI single. Martin has also made two appearances. The 5’8” right-hander struggled in his first outing when he relieved Austin Bergner (North Carolina) against Y-D on June 27. Martin entered the game with the Anglers boasting a four-run lead. When he was taken out, they were up by three and two Red Sox runners were on base. The next day, Martin tossed two strikeouts but conceded a hit and a run against Hyannis. Both hurlers have a chance to be featured out of the A’s bullpen come playoff time. If Holliday opts not to use them, however, they will have eaten up several innings while others got to rest and prepare. PW: Despite being in attendance at yesterday’s ballgame, Chatham officially signed and activated right-handed pitcher Colby Morris (Middlebury). A rising senior at Middlebury, Morris is a three-year starter for the Panthers. This past spring was Morris’ best. As a team captain, he made nine starts plus three appearances out of the bullpen, threw four complete games, and posted a 1.61 ERA and .211 batting average against. For Green Bay Bullfrogs of the Northwoods League earlier this summer, Morris was used as both a starter and a reliever. Making four starts and three relief appearances, Morris was 1-2 with a 1.29 WHIP and 2.57 ERA. His best appearance came on June 27 against the Fond du Lac Dock Spiders. Morris pitched seven strong innings for the Bullfrogs, allowing four hits and no runs while striking out eight runners. Expect to see Morris used out of the bullpen in Chatham. Dan Valerio (Southeastern) is the only position player picked up by the Anglers during this last week. Valerio was a monster during the school year for NAIA Southeastern, hitting .390 with 17 home runs, 27 doubles, 29 stolen bases and 84 RBIs as he was named a Second Team All-American, helping the Fire to the NAIA National Championship. Since being activated on July 24, Valerio has made two starts and come off the bench in two others games. The utility player has solely played second base during his stint in Chatham. In five at-bats, he does not have a base hit, but has drawn a walk. What is one thing to watch for heading into the playoffs? DS: Once one of the most feared pitching staffs in the Cape League, the Anglers’ staff now is tamer due to the departures of three CCBL All-Star selections — Dan Hammer (Pittsburgh), Miller and Veliz. Holliday has brought in several new arms and more are on the way, he said, but their effectiveness has not matched that of the ex-Anglers hurlers so far. Austin Bergner (North Carolina) and Alek Manoah (West Virginia) are slated to start games one and two of the East Division semifinals against Harwich. Jeff Belge (St. John’s) is likely to see playoff action, as well. Beyond those three, Holliday will have some thinking to do when it comes to deciding which pitchers to bring out of the bullpen. Kyle Hurt (Southern California) will be Chatham’s closer. In the set-up innings, Holliday has a multitude of options. Zack Noll (Point Loma Nazarene) and Spencer Van Scoyoc (Arizona State) have been Holliday’s main choices recently, but neither has been extremely effective. Lowder, Martin, Nick Scheidler (UCLA), John McMillon (Texas Tech) and Brock Riley (Salem State) — all of who have had at least one bad outing — make up the A’s manager’s other options. There is no question that the Anglers’ bullpen is not what it once was. In the three remaining regular season games, Holliday said he will continue to give each bullpen arm a chance to show their stuff. Whoever impresses the Chatham manager just might get to take the bump come playoff time. PW: All summer, Holliday has been tinkering with the A’s lineup. Some of it has been because of transactions, but there are very few times when the lineup is consistent from one game to the next. With the playoffs starting on Saturday, it will be fascinating to see how Holliday constructs his lineup. Over the last few weeks, we have seen Holliday run with a more attack-minded lineup, and it has been successful. However, defensive miscues over the last week have been major turning points in games. Going forward, Holliday may decide to have a more defensive lineup than offensive one. The key to this lineup tinkering will be Michael Busch (North Carolina). Busch has been one of the best bats for the Anglers since arriving in Chatham on July 3 and has been a mainstay in the heart of the order. That is not going to change. The key will be what position Busch will be playing. The Minnesota native plays first base in Chapel Hill and arrived as a first baseman, but when an injury spell for Chatham’s infield resulted in a dearth of healthy middle infielders, Holliday slid Busch over to second base. Busch — the No. 1 shortstop in Minnesota coming out of high school — performed well at the spot, showing a natural ability grounders up the middle and range to his right despite the fact he had not played there in over 18 months. Even though he has shown the ability to play a solid second base, Busch is not the team’s best defender at the spot. Busch will be starting in the playoffs. If he starts at second base, Holliday will most likely be deploying one of his offensive-minded lineups. If Busch starts at first base, the lineup will likely be more defensive-minded.